I've always been a carrot cake lover. Moist cake, filled with spices, topped with cream cheese frosting - and even better if it has walnuts of pecans mixed throughout. But that said... I'm a carrot cake perfectionist (I'm an everything perfectionist... but that's beside the point). It has to be just right - so I've been testing a thousand and one different versions, adding things here, taking away things there and I have created the ultimate healthy carrot cake recipe - and by jove, is it good! Prepare muffin tins by greasing/lining or grease and/or line a small cake tin. In a bowl, combine your grated carrot, applesauce, egg whites or substitute, milk, honey and vanilla. In a separate bowl, mix together your flours, baking powder, baking soda and spices. Combine wet and dry ingredients, mixing until just combined. Divide your mixture amongst muffin pans or pour into cake tin. Bake for 15-20 minutes for cupcakes or 30-45 minutes for a cake - or until your cake is cooked through and a skewer inserted removes clean. Cool before taking out of tins. If frosting, cool completely or cool before storing in a container or freezing for later on. Our Favourite "Frosting": when it's just us eating cakes/muffins/cupcakes we usually freeze them or they'll get wasted - so we make a quick batch of "frosting" whenever we want to eat them. Just mix a spoonful of reduced fat cream cheese with maple syrup to taste and there you go. So tell me, what's your favourite kind of cake - and why do you like it so much? My second favourite cake is banana cake because a family friend gave us her famous recipe (in our recipe folder as Fay's Famous Banana Cake) and it was always a crowd pleaser. 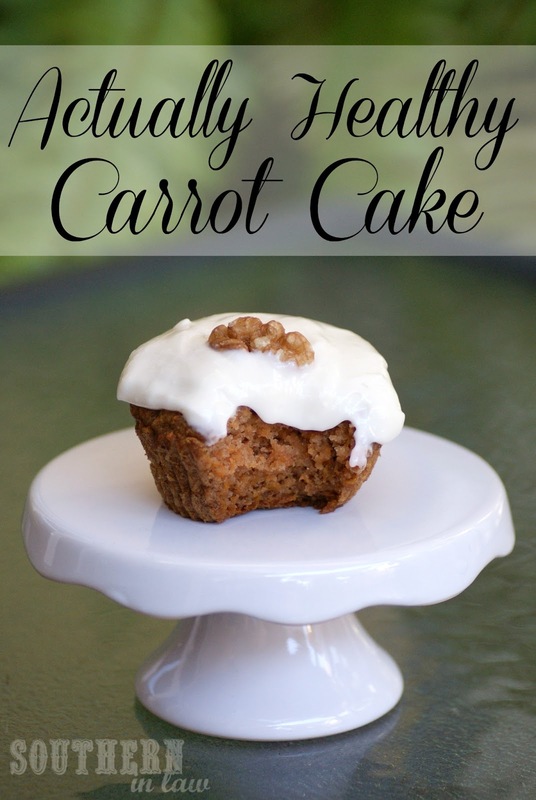 I love carrot cake - and this version looks divine! Just made your muffins but I added 1/8 t. salt to your dry mixture. Good idea! How did you like them? I just found your blog through Pinterest...your recipes look wonderful! I can't wait to try these Carrot Cakes. Thank you for creating healthy recipes with substitution options. I am majorly changing the way I am eating to lose weight and make myself healthier for my kids and myself. I was looking for great looking recipes to try (also trying to cook more) and am excited to try your recipes. Making the carrot cake today. Thank you, Shannon! You're so sweet! Hallo - I made this cake last night and it is gorgeous! :D Simple, healthy, nom! Thanks for this tasty treat! Hilo! Quick question - I'm making this next weekend for a gluten-free party (well, someone's gluten-free so they figured vegan is close enough and I should make the treats) - do you think I could sub the flour for brown rice flour and something else? Not sure what the chances of getting gf self-raising flour this side on the bargain side of the wallet. I'm still learning about how different flours react, so not sure if that would work? Some of these gf flours tend to become very "absorbent" and basically drain the liquid soul of any mixture. Otherwise you could try making your own mix with things like brown rice flour, tapioca starch, sorghum flour etx. There are lots of different versions on the web and you may be able to find a mix which you already have the ingredients for! Do i have to use applesauce? Is there a subsitute? 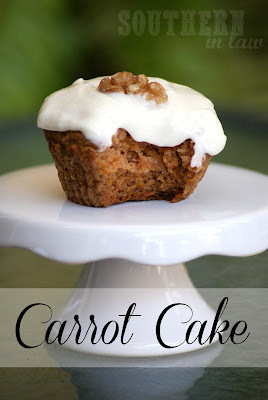 Applesauce gives the carrot cake a really nice flavour and keeps it moist. If you don't want to use it, you could substitute butter/oil or possibly yogurt - but I can't vouch for the texture or taste. Can I use oat, almond or coconut flour instead? And would the measurement still be the same? Hi Kristy, which option typically gives the best results? In terms of flour, egg whites....? Thanks! Hey! I loved these! Is it okay if I link this recipe in my blog? Thank you so much! :D :D loved this I look forward to seeing what other goodies you have in your blog! These look so amazing! Just found your blog. I've been looking for a place like this for all my dietary needs. How in the world do you come up with these recipes?? All in your head? So excited to try them! Hey Tim and Jenn, my brain is pretty much constantly thinking about cooking/baking - if you asked Jesse, he'd tell you I'm insane - but I bake so much that it just comes naturally to me. I've had to adapt so many recipes for my own allergies and intolerances that now it's second nature - once you get the ratios right, you're good to go!